The entire community is invited to celebrate the second night of Passover at Temple Shalom, 5 Ayrmont Lane in Aberdeen. 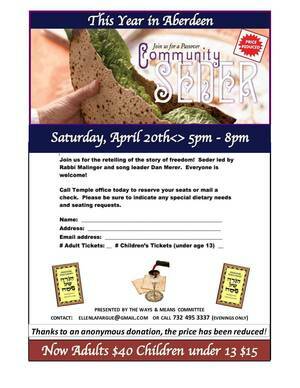 The Seder will begin at 5:00 pm on Saturday, April 20th. The Seder will be led by Rabbi Laurence Malinger, with song leading by Dan Merer. The cost is $40 per adult and $15 per child under 13. For additional information contact Ellen Lafargue at ellenlafargue@gmail.com or call 973.879.8935 (evenings only.). To reserve seats, respond to shalom@templeshalomnj.org or call 732.566.2621.